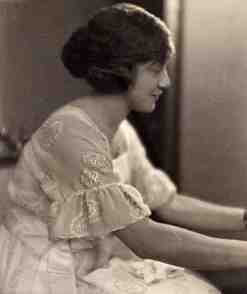 Elizabeth Foxwell: "attached is the draft program for the Helen Eugenia Hagan Monument dedication on Sept 29 at 2P at New Haven's Evergreen Cemetery"
NEW HAVEN >> Helen Eugenia Hagan was a Yale School of Music graduate and African-American concert pianist who entertained black American troops in France after World War I, and she deserves better than to lie in an unmarked grave in Evergreen Cemetery. That’s the opinion of Elizabeth Foxwell, who has edited a book about women of the WWI era, “In Their Own Words,” and who is trying to raise money for a gravestone for Hagan. 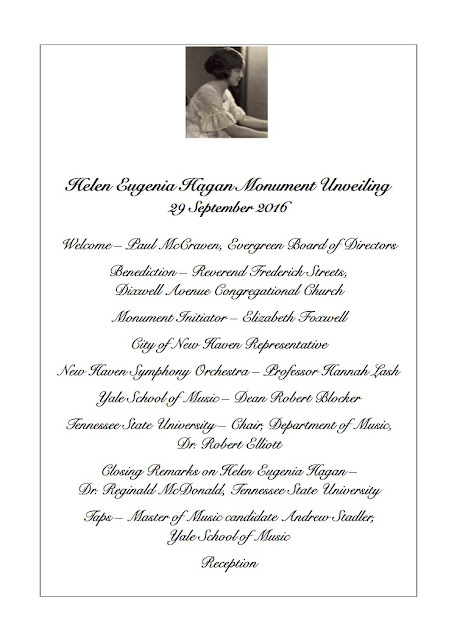 FYI...attached is the draft program for the Helen Eugenia Hagan Monument dedication on Sept 29 at 2P at New Haven's Evergreen Cemetery. You may recall that you wrote a blog post on the crowdfunding effort.